Join the discussion on our forums! Come discuss Naga Corsair over in our dedicated Naga Corsair discussion topic. She kinda looks like a pirate from Shantae. I like this card. A lot. I'm actually a little surprised by that. We're talking about replacements a lot, but I think this might be good for Rogue when Tomb Pillager rotates out. I didn't know Corsair bought the Razer Naga title. Just Read The Flavour Text? This thing is a girl. Doesn't look like one but it is. ... Does naga pirates have submarines? You should ask the Naga navy. I have a feeling their ships don't lie. eh, dunno. With Greenskin, you get to deal much more damage than with this one. I disagree, Durability is much more valuable than Attack. I think i prefer the extra mana cost for an extra durability as well. Decent card for Arena, and is a fun combo with Doomhammer. Aggro Pirate decks might not use it as much because it doesn't really offer as much as a lot of the other Pirate cards. I don't know why people say it's a boring card. 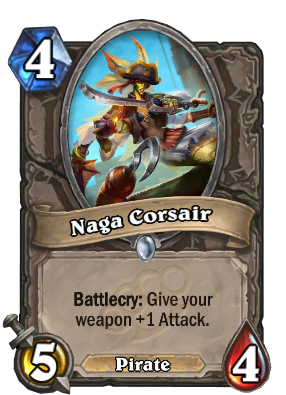 There are not many good 4 mana cost pirates, this card will be included in every aggro pirate deck and even some rogue decks. Bad/boring card until a warrior rekts your 4 drop with fiery win ax.